London Heathrow Airport tops the list of the latest OAG Megahubs International Index of 2018, by quite some margin. On the busiest day for aviation in 2018, there were 66,000 possible international connections between flights arriving and departing within a six-hour time window at the London airport. The OAG’s Megahubs International Index goes beyond the size of an airport’s route network and measures the number of connections possible within a specific time frame and the relative attractiveness of each airport as a connecting point for scheduled air passengers. The top 50 most connected airports in the world as measured by the highest ratio of scheduled connections to the number of destinations served. While Heathrow heads the list by quite some way, it is the only UK airport that makes it into the top fifty, although London Gatwick makes it into the top 25 low-cost megahubs at number 23, unsurprisingly the most dominant airline there is easyJet. The second place in the 2018 OAG Megahubs International megahubs index is the Illinois airport of Chicago O’Hare (ORD) which has moved up the Megahubs index and is ranked in 2nd place this year. The airport has more potential international connections on the busiest day but these are spread across a greater number of destinations. 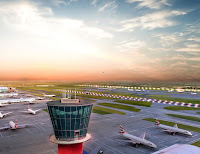 Coming in third and fourth are the European hubs of Frankfurt and Amsterdam Airport, while at number five on the list is an airport that might surprise some people is the Canadian airport of Pearson in Toronto.